TICKETS: $35 for adults, $30 for seniors and only $5 for students. A donation of $75 or more will gain admission to the Gala Champagne reception and support the orchestra’s educational outreach efforts. For tickets, call the Monmouth Symphony ticket line at 732-806-7680. To learn more about the Monmouth Symphony Orchestra and their programs, visit their website at www.monmouthsymphony.org. The Monmouth Symphony opens its 67th season with a special evening concert featuring the glorious music of Strauss, Grieg, and Rachmaninoff and the beautiful voice of soprano Victoria Cannizzo, preceded by an Opening Night Champagne Gala. For the first concert of the new season, Music Director Roy Gussman has selected a program designed to delight the audience. The concert will open with “Im Herbst” (“In Autumn”) by Edvard Grieg, a tone poem evoking the beautiful colors, crisp weather, and wonderful sights and sounds associated with this time of year. Soprano Victoria Cannizzo, who has appeared twice before with the orchestra to great acclaim, returns to perform the Four Last Songs of Richard Strauss. Written in the year before the composer’s death, these songs feature the beautiful soaring melodies for which Strauss is known, providing an excellent showcase for Ms. Cannizzo’s voice, described in the press as “complex” and “strikingly beautiful”. Rachmaninoff’s Second Symphony, which will be performed by the MSO on the second half of the concert, was received with tremendous applause at its 1908 premiere. Filled with lush romanticism, it is evidence that Rachmaninoff had hit his stride as a composer, and it continues to elicit an enthusiastic response from today’s audiences. In celebration of opening night, supporters and friends of the symphony are invited to gather in the Carlton Lounge at the Count Basie Theatre for an elegant champagne and hors d’oeuvres reception at 6 p.m. Then at 7:15 p.m., MSO bass trombonist and program annotator Tom Avakian will host a pre-concert interview with soloist Ms. Cannizzo on the stage of the Count Basie Theatre. 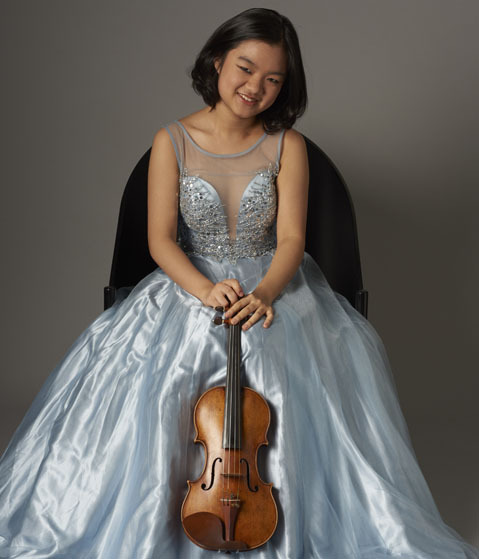 Violinist Miranda Liu: Praised by audiences and critics alike for her “perfect” (Oberbayerisches Volksblatt) and “brilliant” (Salzburger Nachrichten) technique, as well as for her mature and compelling interpretations, Miranda Liu is among the most important young violinists today. Her extensive musical knowledge and emotional intensity can be heard i n her performances of master works - from the Baroque, Classical and Romantic eras to the fresh new works of present day composers.Ms. Liu has performed in hundreds of concerts as a concerto soloist, recitalist,Ms. Liu has performed in hundreds of concerts as a concerto soloist, recitalist, and chamber musician throughout the USA, Austria, Germany and Hungary, as well as on concert stages in Belgium, Croatia, Czech Republic, England, France, Italy, Lithuania, Poland, Portugal, Romania, Slovenia, Spain, and Switzerland. She performs regularly in prestigious concert halls such as: New York’s Carnegie Recital Hall, Philadelphia’s Verizon Hall, Providence's Veterans Memorial Auditorium, Miami Beach's New World Center, Zagreb's Croatian Music Institute, Bucharest's Radio Society Concert Hall, Budapest's Liszt Academy of Music, Vienna's Konzerthaus-Mozartsaal, Salzburg's Wiener Saal, Solitär, and Carabinierisaal, among many other venues. Soprano Maria Alu has been an audience favorite with BONJ on several occasions. She has sung roles in productions, oratorios and recitals around the New York/New Jersey area as well as across the country. Among her many great appearances with the orchestra were her unfortgettable performances as Cleopatra in Giulio Ceasre and The Queen of the Night in The Magic Flute. She was also acclaimed for her moving performance of Gilda in Verdi's Rigoletto with Opera at Florham. In Baroque repertoire, she excelled in the virtuosic showpiece cantata Jauchzett Gott in Allen Landen by Johann Sebastian Bach. Rodrigo's Concierto de Aranjuez has been rescheduled for June 5, 2016. Guitarist Stanley Alexandrowicz will perform selections by de Visee and Cortes at the concert November 1. Antonio Vivaldi (1678-1741) composed his set of 4 concerti called The Four Seasons in 1729, They remain among the most original and popular compositions of all time. Each is divided into three movements and relates stories of Spring-Summer-Autumn-Winter as related in accompanying sonnets most likely written by Vivaldi himself. The cantata nulla in mundo pas sincera is a rarely heard work for soprano soloist and orchestra, edited by Maestro Robert W. Butts. Dunellen Skylight Theatre Productions is seeking qualified applicants for their 2016 season who are interested in directing a play and/or musical. Dunellen Skylight Theatre Productions is a non-profit organization that showcases quality theatrical presentations with a mission to entertain, inspire, educate, and advocate through the arts. We strive to create an environment where local performers, directors, playwrights, and other artisans can display and cultivate their talents. Youth Theatre Production: Show selection must be age appropriate for audiences ages 2 and up. WHERE: Performance and rehearsals take place at the Dunellen Presbyterian Church auditorium. Performance space details: Theater has a small stage (13’ wide x 16’ deep) and seating capacity of about 75. Musical in the Park Production: Show selection must be appropriate to produce in a public park. This production must be a musical. WHERE: Performance takes place on our gazebo stage at Washington Memorial Park, Dunellen, NJ. Rehearsals take place downstairs at St. John’s Roman Catholic Church. Performance space details: Theater has a stage (20-24’ wide x 20’ deep) built off a gazebo in the park (provides 12’ wide x 16’ deep of performance space) and seating capacity of about 150. This is an outdoor venue and in case of rain performances take place in the basement of St. John’s Roman Catholic Church. Additionally, we at Dunellen Skylight Theatre Productions are looking to expand our season by adding a Fall/Winter performance to our schedule. In doing so, we need your input. We are soliciting proposals for smaller scale productions that showcase both originality and creativity. Submit your ideas to us for a night of One Acts; a concert version of your favorite Broadway show; a cabaret event, or even a show that could become a holiday tradition for Dunellen Skylight Theatre Productions. We want to see what you’ve been working on! Dunellen Skylight Theatre Productions places an emphasis on things like clarity of the director’s vision, diversity of perspective, overall workability, and strength of audience appeal when deciding to produce any work. ** If unable to provide the full libretto or recording at the time of submission, please include a note as to when it could be made available. Applications must be submitted no later than October 31, 2015. The Theater Project, an award-winning, professional theater in Maplewood, NJ, is now soliciting short plays for “Fast Forward,” its third annual short play competition in February 2016. The contest is open to adult playwrights in the New Jersey-New York area. The Theater Project, which also offers a competition for high school playwrights and presentations of original plays by New Jersey authors, sees this as a logical extension of its mission. Plays can be either dramas or comedies but must be no more than 15 minutes running time. The deadline for submitting plays is November 20, 2015. Plays and actors compete for audience favorite awards; one playwright is chosen to receive the $500 Critics Choice grand prize. These performances will be open to the public and take place at The Burgdorff Center for the Performing Arts in Maplewood, NJ. The Theater Project, a professional theater company based in Maplewood, NJ, began in 1994 with the goal of bringing the best contemporary plays to our community. The company is known for presenting outrageous comedy as well as drama with social commentary. WHEN: Sunday, November 1, 2015, at 2:00 PM. TICKETS: $35 General Public; $30 Members/Seniors/Subscribers; $15 Students (18 & under or a valid college ID). Carolyn Dorfman Dance, whose bold and dramatic works connect life and movement, returns for an afternoon of repertory favorites highlighting both the intimacy of the duet and the power of the ensemble. The company will present three varied works by Artistic Director Carolyn Dorfman. Hailed as a consummate storyteller, Dorfman, the daughter of Holocaust survivors, has also created a celebrated body of work that honors her Jewish legacy. The company will present The Klezmer Sketch, in which Dorfman mines the exuberant, yet soulful quality of Klezmer music that inspired her exploration of Jewish gesture, expression, ritual, character and values. The program concludes with Under My Skin. With original music by composer/vocalist Jennifer Giering, this set of three songs chronicles the growth and depth of a relationship. Under My Skin is an evocative and sensuous duet exploring concealment and revelation, isolation and trust. Tickets may be purchased online at www.morrismuseum.org, by phone at (973) 971-3706, or in person at the Bickford Theatre Box Office. The Bickford Theatre is an integral part of the Morris Museum, located at 6 Normandy Heights Road in Morristown, NJ, and offers free parking and full accessibility. Box Office hours for phone sales are Monday through Friday, 10:00AM to 5:00PM. Walk-up hours are Tuesday through Friday, 11:00AM to 5:00PM. Evening includes drinks and light fare. Proceeds go to support Mile Square Theatre, which is a 501c3 non-profit. Join Mile Square Theatre for a very special fundraising event. Some of Broadway’s most dynamic performers come to Hoboken for an evening of show tunes from productions past and present. At this writing the following performers have confirmed: Rich Affanato (The Producers, Les Miserables), Don Brewer (Les Miserables, Mamma Mia, The Pirate Queen), Anne Brummel (Wicked, Evita), Ashley Loran (Jekyll and Hyde), Marissa McGowen (A Little Night Music, Les Miserables), Joe Paparella (Good Vibrations, Jesus Christ Superstar, Martin Guerre, Les Miserables), and Michael Williams (Wicked, West Side Story, On The Town). Mile Square Theatre will soon open the doors at its new facility at the Artisan at 14th and Clinton Streets. The facility will feature a state of the art 130-seat theatre and studios for rehearsals and classes for Mile Square Theatre Education. MST’s Broadway Cabaret is a benefit to help support Mile Square Theatre’s first season at the Artisan, which will begin in March 2016. ARTS/DEPARTMENT OF STATE, A PARTNER AGENCY OF THE NATIONAL ENDOWMENT FOR THE ARTS AND BY FUNDS FROM THE NATIONAL ENDOWMENT FOR THE ARTS, ADMINISTERED BY THE HUDSON COUNTY OFFICE OF CULTURAL & HERITAGE AFFAIRS, THOMAS A. DEGISE, COUNTY EXECUTIVE, AND THE BOARD OF CHOSEN FREEHOLDERS. Mile Square Theatre (MST) is the leading professional Equity theatre in Hudson County. Since 2003, MST has presented full-scale productions for adults and children, in addition to providing theatre education programs. Under the artistic direction of Chris O’Connor, MST receives support from The Geraldine R. Dodge Foundation and the Hudson County Division of Cultural Affairs. For company information, please visit www.milesquaretheatre.org. Grammy Award-winning legend Mavis Staples (“I’ll Take You There”) teams up with multi-platinum recording artist Joan Osborne (One of Us”) on the highly anticipated national tour, "Solid Soul." Six-time Grammy® award-winner and multi-platinum recording artist Amy Grant will perform for one night only at Mayo Performing Arts Center. “An Evening With Amy Grant” will treat concert attendees to some of Grant’s biggest hits (“Baby Baby,” “Every Heartbeat,” “That’s What Love is For” ) as she performs songs from her extensive repertoire, along with selections from her recently released, critically-acclaimed album How Mercy Looks From Here. Don Felder, former lead guitarist of The Eagles, returns to Mayo Performing Arts Center. Don Felder is renowned as a former lead guitarist of The Eagles, one of the most popular and influential rock groups of our time. A member of The Rock and Roll Hall of Fame since 1998, Felder served as a member of The Eagles for 27 years, putting his mark on numerous Eagles milestones. Felder originated the music and co-wrote The Eagles biggest hit – the iconic, Grammy-studded smash “Hotel California” – along with fan favorites like “Victim of Love” and “Those Shoes.” He became immediately celebrated for his lyrical, signature guitar work on legendary songs like “Hotel California,” “One of These Nights,” “New Kid In Town,” and numerous more. “Hotel California” was recently voted the Number 1 best 12 string guitar song in the world by Guitar World magazine. The Theater Project is once again reaching out to creative young people in its fourteenth annual Young Playwrights Competition. Winners receive cash prizes and see their work performed by professional actors at the awards ceremony in March of 2016. The submission deadline is January 19, 2016. New Jersey’s high school playwrights submit their short plays at www.TheTheaterProject.org website, where they will find all the necessary entry guidelines and formatting rules. The Theater Project is an award-winning professional company in residence at The Burgdorff Cultural Center in Maplewood, NJ. Several past winners of the Playwrights Competition have gone on to pursue degrees in theater and playwriting, and they often return to The Theater Project to present prizes and share their journeys with the newest honorees. Jake is a frequent guest speaker at the awards ceremony, where he shares his experiences and takes questions from the younger writers. "Working with the Theater Project on the Young Playwright's Competition is always one of the highlights of my year,” Jake said. “It's such a treat to show these enthusiastic and talented high school students that their hard work is both deserving of celebration and worthy of being shared with the community." On the day of the ceremony, the judges and members of The Theater Project’s Adult Playwrights Workshop also offer half-hour tutorials to any interested contest entrant. Complete competition guidelines are available at www.TheTheaterProject.org. WHEN: November 1, 2015, at 3 p.m.
Enlow Hall’s popular Concerts & Café Series begins in November with perennial favorite. Joseph Colaneri, Music Director of the renowned Glimmerglass Festival, conducts northern New Jersey’s premier string orchestra with solo harpist André Tarantiles in Marcel Grandjany’s Aria in Classic Style and Claude Debussy’s Danse sacrée et Danse profane. The program concludes with Béla Bartók’s thrilling Divertimento for String Orchestra, to be followed by light refreshments and a public reception with the artists. WHEN: November 8, 2015, at 3 p.m.
Also this fall, Enlow Hall welcomes the Grammy Award-winning King’s Singers, one of only two vocal ensembles ever to enter the Gramophone Hall of Fame. Legendary jazz trumpet and flugelhorn player, a 10-time Grammy Award winner, recipient of the Presidential Medal of Freedom, and protégé of the one and only Dizzy Gillespie, Mr. Sandoval and special guests will perform an afternoon of holiday classics, including Feliz Navidad, Silent Night, The Christmas Song, O Christmas Tree, and It’s Beginning To Look A Lot Like Christmas. WHEN: February 6, 2016 at 7:30 p.m. WHEN: February 21, 2016 at 3 p.m. WHEN: March 13, 2016 at 3 p.m. WHEN: April 10, 2016 at 3 p.m. WHEN: April 21, 2016 at 7:30 p.m. WHEN: April 24, 2016 at 3 p.m.
TICKETS: Single tickets range from $25 - $75, and may be purchased by calling the Kean Stage box office at 908-737-SHOW (7469) or visiting www.keanstage.com. Tickets may also be purchased in person at the Kean Stage Box Office, located in Kean University’s Wilkins Theatre at 1000 Morris Avenue in Union. Completed in 2009, the Eugene and Shelley Enlow Recital Hall was specifically designed to showcase world-class musicians in an intimate setting. Conveniently situated on Kean University’s East Campus in Hillside, the 5,000 square foot, 324-seat performance hall is home to an exclusive Fazioli F308 concert grand piano and professional recording studio. For more information on Enlow Hall’s amenities and upcoming programming, please visit www.keanstage.com. Kean Stage presents professional dance, music and theatre performances in premier venues throughout Kean’s campus, including Enlow Hall. Kean Stage’s mission is to educate, entertain and challenge audiences by presenting professional programs of high quality that reflect the ethnic and cultural diversity of the central and northern New Jersey region. These programs extend and supplement the intellectual life of the classroom, increase opportunities for community and university interaction, and provide affordable access to the arts for New Jersey residents and students of all ages. To purchase tickets or request a season brochure, please call the Kean Stage box office at 908-737-SHOW (7469), email ticket@kean.edu, or visit www.keanstage.com. South Pacific, a Rodgers and Hammerstein musical, takes place on an island in the South Pacific during World War II. This musical explores two intercultural love stores. The Americans fight to come to grips with their own cultural prejudices and falling in love while the threat of war continues to draw near such this land of paradise. learn a simple dance routine. Please be prepared to note conflicts during your scheduled audition. fee: Fee for all 4: $60 JCC members; $75 general admission. Fee for one: $18 JCC members/$22 general admission. For more information or to register, contact Judy Lattif at jlattif@jccotp.org or 201.408.1457 or call Michele at 201.408.1496. Dr. Goldman is adjunct professor of cinema at Yeshiva University and film reviewer for The Jewish Standard. He received his Ph.D. in Cinema Studies from New York University and was a fellow at Columbia University. His most recent book, The American Jewish Story Through Cinema was published last year by University of Texas Press. He is founder and president of Ergo Media, a video publishing company. Professor Goldman recently joined Robert Osborne as a co-host on the TCM-Turner Classic Movies cable network. A heart-warming look at a Montreal family and the political and social differences that separate a father and his son. Illness forces a reunion between the father who has devoted himself to left-wing causes, wine and womanizing and his son who fled to England where he became a millionaire. Arcand gives us a thought-provoking film about life, society, friendship and family. A powerful look at a 1984 East Germany full of lies and deception. Big brother is always watching! One man spies on another and everyone must be disloyal or else why spy? In this cleverly scripted story, a secret policeman lusts for the lover of someone he spies on and he looks for ways to prove subversive activity. But what if there is none? A chance meeting between Irene, a judge, and Benjamin, a retired investigator, lead to their reconsideration of a murder that took place twenty-six years before. Both believe that innocent men were found guilty and put in jail. As we journey between 1974 and 2000, we grasp the political dynamics that overshadowed the trial and the strong connection these two have always had for each other. Set in present-day Iran, where Islamic law is law of the land, we watch how everyday life is impacted by religious observance and law. Nader and Simin are a happily married middle class couple who want to move abroad for the sake of their daughter, but a family issue gets in the way and they find themselves in divorce court. Although they really want to stay married, Sharia law takes over. The Jewish Heritage Museum of Monmouth County offers a Hanukkah Menorah/Platter Painting Event, on Thursday, November 19, 2015, from 4:30 PM – 6:00 PM, at Around the Corner Art Center, 290 Mounts Corner Drive, Freehold, NJ 07728. Around the Corner Art Center is located next to the Museum in the Mounts Corner Shopping Center. The cost is $12.00 per child includes all supplies needed, and is non-refundable. Reservations are required in advance, so that sufficient supplies are available. Space is limited so make your reservations early. This is the fourth year that a Hanukkah craft project is being offered by the Museum. During the program, which is subsidized by the Museum’s Druin Education Fund, children, pre-school ages and up, will be guided by the staff at the Art Center to paint their own ceramic menorah or platter (Young children will need adult supervision). Parents are encouraged to assist their child with the project. After completion that day, the piece will be dried and fired, and returned to the Museum for pick up the following week. The Jewish Heritage Museum is located in the Mounts Corner Shopping Center, at 310 Mounts Corner Drive Freehold, NJ, at the corner of Route 537 and Wemrock Road. It is on the second floor of the historic Levi Solomon Barn. The JHMOMC is a tax-exempt organization under Section 501 (c)(3) of the Internal Revenue Code and is handicapped accessible. NJMEA Honors Guitar has been approved! The 2015-16 school year will be the first time that a NJMEA Honors Guitar Ensemble will exist for NJ guitar students in grades 9-12. See the links below and attachments to prep your students for the audition. There are detailed instructions. It is important to spread the word to the teachers who you know in NJ and mark your calendars for April 16, 2016, as this will be the NJMEA Guitar Festival at The College of New Jersey in Ewing, NJ which will feature the chosen students, as well as featured guest artist for performance and master class by the Atlantic Guitar Quartet from Baltimore (right). We need to have student and teacher participation on many levels. Students will need to be sponsored by their K-12 music teacher who should be a member of NJMEA so communication with these educators is important. Please consider volunteering your time to help as an adjudicator, sectional coach, and other festival duties. Otherwise this will be unsuccessful! Twelve students will be awarded the title through an audition process that is modelled after what the Virginia Music Education Association and their All State Guitar Ensemble guidelines are. There will also be showcase performance opportunities for other school ensemble groups and soloists, concerts, workshops and master classes at the festival. It is important to spread the word to as many guitar educators and students as possible. A special note to students auditioning, teachers and parents: This is a commitment and 100% participation is required on all dates. If this cannot be honored, please do not audition. In this issue you will find the appropriate sign up forms and audition requirements. WHERE: The College of New Jersey (music dept), 2000 Pennington Rd. Sight Reading at the audition. Students will be judged on a point system for correct notes and rhythms, tone quality, musicality: dynamics, phrasing, interpretation and overall quality of preparation for prepared piece, ensemble excerpt, scale and sight reading. WHEN: Friday, October 30 at 8:00 pm; Saturday, October 31 at 3 & 8 PM; Free Halloween Reception following October 31 8pm show! Credit card advance ticket purchases will include a $1 per ticket charge to offset our online credit card charges. What if Matt Damon and Ben Affleck didn’t really write Good Will Hunting, but instead had the script drop fully-written into their laps from the sky? Suppose Matt and Ben were visited by and received advice from Gwynth Paltrow and J.D. Salinger? What if they were portrayed by women? Dragonfly Multicultural Arts Center of Metuchen will answer these questions when it presents the wacky comedy Matt & Ben, in which two actresses play the stars before they were…well, stars. For more information, visit www.dragonflyartsnj.com, call 848-229-3501, or email dragonflyartsnj@gmail.com. Dragonfly Multicultural Arts Center is a 501(c)(3) non-profit performing arts organization dedicated to diversity and arts education. The evening kicks off with a curator-led tour of Vagrich Bakhchanyan: Accidental Absurdity, the first U.S. retrospective on the artist. Slide Jam welcomes artists Megan Suttles and Jim Toia to discuss their new artwork and answer questions. The Rutgers Afro-Caribbean Ensemble, directed by Professor Bill O’Connell, performs throughout the evening. Complimentary refreshments courtesy of Hidden Grounds. For details, visit the webpage. Poet Evie Shockley performs her elegy to the performance artist and poet Jayne Cortez and scholar Carter Mathes provides remarks about Cortez’s collaborations with her husband, sculptor Melvin Edwards. Shockley, LaTasha N. Nevada Diggs, Thomas Sayers Ellis, and saxophonist James Brandon Lewis, perform original prepared works, as well as improvisations, that evoke the spirit of Cortez’s aesthetics. Held in conjunction with the Zimmerli’s exhibition Melvin Edwards: Five Decades, the program is a collaboration between the museum and the Department of English at Rutgers. ADMISSION: FREE admission and complimentary refreshments. For program details, visit the webpage. 2 MORE CHANCES TO SEE “SLEEPY HOLLOW” IN HOLMDEL! The Legend of Sleepy Hollow! Seating is extremely limited! BUY NOW! Get into the Halloween spirit with Washington Irving's classic tale of Ichabod Crane and the Headless Horseman! Adapted by Christopher Cook, this stage version of The Legend of Sleepy Hollow brings to life the eccentric characters, pastoral landscapes, and scary ghouls of Irving's timeless masterpiece. TWO RIVER THEATER MOUNTS BIGGEST SHOW YET! BECOME PART OF GINGERBREAD WONDERLAND!